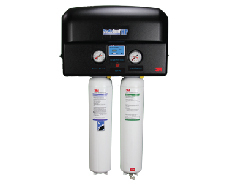 3M Purification Inc. is proud to present the newest innovation in water filtration technology, the 3M Water Filtration Products ScaleGard HP reverse osmosis system. The ScaleGard™ HP incorporates a unique modular design that allows the system to grow with business needs. Simply add RO expansion heads to double or triple the RO water production. The system also incorporates a “smart” diagnostic monitoring system that alerts the operator if the ScaleGard™ HP system requires maintenance. This feature also allows the operator to monitor system performance. The new ScaleGard™ HP reverse osmosis system produces 750 to 938 gallons of Recipe Quality Water™ per day for a better tasting cup of coffee, espresso or cold beverage. Equipped with a precision blending valve, this wall-mountable system allows a store owner to dial in the desired level of dissolved-minerals for the perfect cup of coffee, espresso or cold beverage. At the very heart of the ScaleGard™ HP system is its revolutionary Integrated Membrane Pre-Activated Carbon Technology (“I.M.P.A.C.T.”) media which is great for reduction of bacteria, cysts, and particulates. The “I.M.P.A.C.T.” media also includes chloramines and chlorine protection to help reduce equipment corrosion. The ScaleGard™ HP also includes an industry proven heavy duty booster pump that allows it to work as specified regardless of incoming water pressure. The robust pump design significantly reduces pump maintenance costs and downtime as compared to standard diaphragm pump models. VERNON HILLS, ILLINOIS (January 5, 2016) – Scotsman Ice Systems’ Meridian™ HID525 ice and water dispenser has received a 2015 GOOD DESIGN™ award, the world’s most prestigious, recognized and oldest Design Awards program organized by the Chicago Athenaeum Museum of Architecture and Design. Designed with space, production and installation in mind, the Meridian unit offers premium reliability, time-saving serviceability and convenient cleaning innovations. The Meridian™ HID525 features durable stainless steel components, larger sink drain openings and enhanced, high-tech dispensing that helps prevent overflow. Additionally, AquaArmor with AgION® is molded directly into key components to help inhibit the growth of bacteria. Meridian™ models also feature Scotsman’s exclusive greaseless bearing design, a fully sealed configuration that eliminates the need for grease — saving valuable time and labor and ensuring a safer ice supply. Ideal for any area where space is at a premium, Meridian™ HID525’s specially designed contoured side panels and external air filter offer maximum breathability with minimal clearance required. Additionally, the Meridian™ HID525 is up to 15 percent more efficient than the competition, providing the most energy savings possible. The Meridian™ HID525 helps reduce maintenance time at every step. Scotsman’s convenient USB drive allows fast software updates without replacing the control board, and a unique removable front panel makes it easy to access and service all key internal components, saving valuable time. When service is needed, intuitive LED diagnostic lights reduce downtime, and the QR code provides quick access to unit-specific service manuals and warranty information. With best-in-class technology powered by infrared sensors that intuitively sense start and duration, Meridian™ HID525 features an enlarged dispensing envelope and offset spouts to accommodate a variety of containers. All Meridian™ models produce the new H2Nugget ice form which is easier to dispense while still being the softest, most chewable ice on the market. For more information on the Meridian product line, visit www.scotsman-ice.com/meridian. As one of the world’s largest manufacturers of ice systems, with more than 300 models of ice machines, storage bins, and ice and water dispensers, Scotsman is dedicated to developing today’s most innovative ice solutions. Committed to US manufacturing, Scotsman manufactures 99% of our equipment at our award-winning production facility in Fairfax, South Carolina. In 2013 and 2012, Scotsman earned the ENERGY STAR® Partner of the Year Award; and in 2011, Scotsman was the recipient of the ENERGY STAR Award for Excellence in Energy-Efficient Product Design. Now, Scotsman’s Prodigy Plus® technology takes energy and water consumption to the lowest levels ever, making a notable difference in the environment and your bottom line. For more information, visit www.scotsman-ice.com. GOOD DESIGN™ is the world’s most prestigious, recognized, and oldest Design Awards program organized annually by The Chicago Athenaeum Museum of Architecture and Design in cooperation with the European Centre for Architecture, Art, Design and Urban Studies. GOOD DESIGN covers new consumer products designed and manufactured in Europe, Asia, Africa and North and South America. VERNON HILLS, ILLINOIS (October 12, 2015) – The 2015 NACS Show marks the premiere of Scotsman Ice Systems’ Prodigy Plus® and Meridian™ ice machines in the convenience store market. Released earlier this year, the Prodigy Plus line includes both cube and nugget models, which are ideally suited for the convenience store industry, and the Meridian units are designed for convenience store environments with a need for an efficient and reliable source for ice and water. Developed to help convenience store owners and franchisees do more, Prodigy Plus delivers significant cost savings, less downtime and more reliable ice-making performance. Furthermore, the Prodigy Plus cube and nugget ice machines enable owners and operators to meet a variety of ice form needs with a single manufacturer. 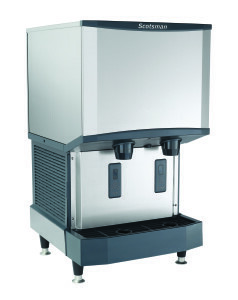 Standard cube ice is ideal for carbonated beverages, ice dispensing and ice retailing. The nugget form, The Original Chewable Ice® invented by Scotsman more than 30 years ago, absorbs the flavor of the drink which keeps customers satisfied with their fountain beverage down to the last chewable bit of ice. For the operator, offering Nugget Ice can not only help draw customers to their store, but also can keep beverage costs down as Nugget Ice displaces more liquid than cubed ice, lowering syrup costs per cup. With the introduction of Meridian™ from Scotsman, convenience store owners and operators also have a choice that incorporates the latest in ice- and water-dispensing technology. With the smallest available operational footprint relative to capacity, Meridian was developed with space, production and installation in mind and offers premium reliability, time-saving serviceability and convenient cleaning innovations. Visit Scotsman at Booth #5657 at the 2015 NACS Show to see the Prodigy Plus and Meridian ice machines firsthand. For those not attending the show, the Scotsman Ice Machine Configurator can help determine the right ice machine for a specific convenience store operation. You need to stay profitable. But there doesn’t seem to be an easy way to do so—with rising food costs, higher wages and evolving trends and demands, virtually any move you make can have an unintended consequence. If you decide to decrease labor, for example, it would have a negative impact on the quality of service you provide to their customers. If you increase prices to stay even with the market, it could scare customers away — as discretionary income levels haven’t kept pace with the cost of activities like eating out. The steps left for operators to take include those that will optimize their facility, equipment and processes. One particularly easy-to-control cost is frying oil. After food, it’s likely that oil ranks near the top of most operators’ lists of costs surrounding their frying operations. 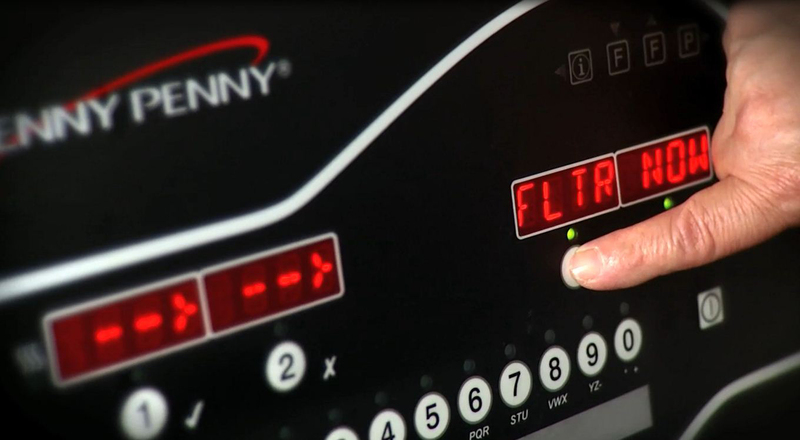 Practicing proper oil management is a great start to realizing oil-related savings, but the biggest savings comes with reduced oil volume fryers like Henny Penny’s next-generation Evolution Elite with Smart Touch Filtration™, which uses 40% less oil in the frying vat. For the average operation, that’s about $5,000 in annual oil costs saved. If your profit margin is 5%, that $5,000 savings has the same profit impact as increasing sales by $100,000, without the extra work! Many operators may feel uncomfortable making a capital investment for such equipment, but it’s important to consider the ROI. For many establishments, the Evolution Elite will pay for itself in less than three years, then continue to deliver savings every year for the life of the fryer. By investing in smart, oil-saving technology like the Evolution Elite with Smart Touch Filtration today, operators can realize greater profits for years to come — and it all starts with a few drops of oil. Nothing in the kitchen uses more energy than the broiler. Generally broilers get turned on in the morning and stay on through the evening dinner crowd. 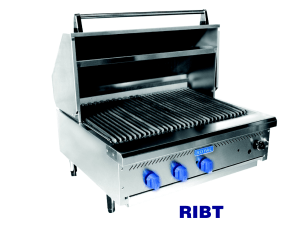 To help minimize that huge energy cost Royal introduced the “Thermostatically Controlled Infrared Hooded Broiler.” To start with, the RIBT’s infrared burners provide intense heat yet use less gas than traditional burners. Consequently, the unit can produce more product during a given time period. In off-peak hours, a built-in thermostat can be set to maintain a designated temperature at the cooking surface and the hood can be closed to capture the existing heat. According to independent lab testing (via Fishnick.com / Food Service Technology Center) the unit produces 24% more food product while reducing energy 22.9%.